Outside of Italy, meatballs are most often served with spaghetti, but in Italy, they are presented quite differently. They make an excellent antipasto cooked in a tomato or wine sauce, or coated in bread crumbs and served plain. 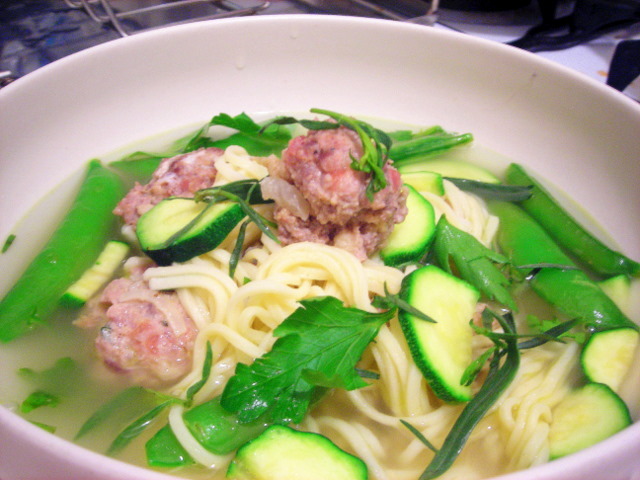 Here, I’ve poached them in chicken stock and paired them with angel hair pasta, summer squash and sugar snap peas. This is lovely, served either as a primi (or first course), or as an entrée. Soak the bread in the milk. When soft, squeeze out and discard the liquid. Use your hands to mix the bread with the remaining ingredients. Take roughly 1 tablespoon of the mixture at a time and form it into a round ball. If serving as a main course, make the meatballs larger. Bring two quarts of seasoned chicken stock or beef stock to a boil. Drop in a few meatballs at a time. They are cooked when they float to the surface. Lift them out with a slotted spoon and transfer to a platter. Serve in bowls with a little of the poaching liquid. If using in another recipe, keep warm. 27 Jun	This entry was published on June 27, 2009 at 12:51 am. It’s filed under food, general, Italian food and tagged cooking, dinner, food, food photography, meatballs, pasta, peas, recipe, summer squash, vegetables. Bookmark the permalink. Follow any comments here with the RSS feed for this post. These look great! I love that you include prosciutto in your meatballs, It’s one of my favorite things, so these are immediately more appealing than the recipe I’d been using. Very nice! You don’t really need that much. You could make it with ground beef but I find that a mixture of beef and pork is the way to go.